Sensational pre-training preparation in the form of convenient shotu! The formula was based on the highest quality active substances, in suitable doses. Not only provides a boost of energy during training, but also increases the functional capacity of the body. A solid dose of AAKG in each serving to improve the effect of the pump training! It contains added vitamins B6 and B12. 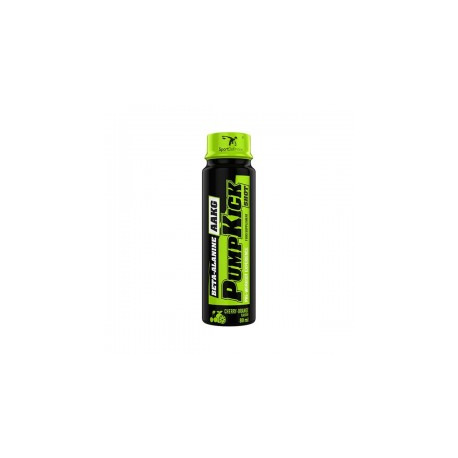 Sport Definition PumpKick SHOT SHOT pre-training is based on the latest scientific knowledge and experience in the supplement industry. A solid dose of active ingredients provide maximum support even during hard training! Not without significance is the liquid form of the preparation, which allows much faster it is absorbed. Formula contains substances such as beta-alanine, caffeine, B vitamins (B6, B12), glukuronolactone and alpha-ketoglutarate (AAKG) pump to improve the training. Vasodilation also provides a faster oxygenation and nutrition of body cells, which significantly accelerates post-workout regeneration. Refined SHOT NO pre-workout Creatine - check in between cycles CANCEL! SPORT DEFINITION PUMPKICK SHOT - ATTITUDES IN THE HIGHEST QUALITY AND EFFICIENCY! 1 serving drink before or during exercise. Ingredients: water, beta-alanine, alpha-ketoglutarate-L-arginine (AAKG), taurine, caffeine, glucuronolactone acid (citric acid), acidity regulator (citrate trisodium), natural flavorings, sweeteners (sucralose, acesulfame K) preservatives (sodium benzoate, potassium sorbate), a dye (Ponceau A - E124), vitamins [vitamin B6 (pyridoxine hydrochloride), vitamin B12 (cyanocobalamin)]. E124 - may have an adverse effect on activity and attention in children.